Mmmmmm…. Potato Latkes for Chanukah from Susie Fishbein’s Kosher by Design! 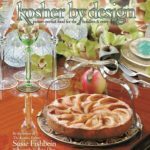 Enjoy this & other fabulous recipes in Kosher By Design. Using the grating disc of a food processor, grate the potatoes. Remove half of the grated potatoes to a large strainer set over a large bowl. Replace the food processor disc with the metal blade. Add the onion and scallions. Pulse until mixture is smooth. Add the potato/onion mixture to the grated potatoes in the strainer. Push down to strain out as much liquid as possible. Let the liquid sit in the bowl for 5 minutes. Pour off the liquid, reserving the potato starch at the bottom of the bowl. Add the potatoes to bowl with potato starch. Mix in the egg, salt, pepper, and parsley, if desired. In a large skillet, heat the oil until very hot, but not smoking. Add the potato mixture 1 heaping tablespoon at a time. Fry until golden, flip and fry until golden on the other side. Drain on paper bags or paper towels. Do this until all the batter is used. You can make the latkes up to 4 hours in advance. When ready to serve, bake at 375F for 5 minutes. They can also be frozen and reheated at 375F for 8 minutes per side. Serve with applesauce and/or sour cream. Learn more incredible recipes like this at the Susie Fishbein and Friends Culinary Institute at Camp Shoshanim. Campers entering grades 3-10 can sign up for a culinary session and learn a vast array of cooking and baking skills while getting to enjoy the summer of a lifetime at our ruach-filled Orthodox sleepaway camp exclusively for girls.